Musically, the tenor saxophonist borrows a lot from traditional Indian music, basing pieces on unusual groups of notes or pulses, (6 1/2, 15, 23, 31) which accelerate or slow down at his discretion. West African rhythms are used in another piece, which makes drummer royal hartigan sound like two players. 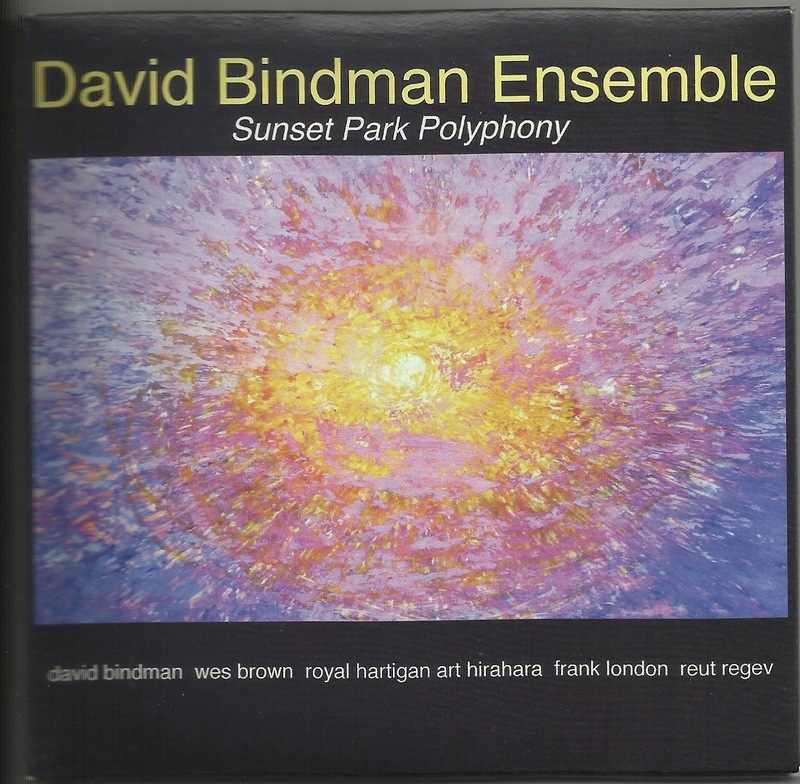 The double-disc set has a fair amount of text for each piece, but the music doesn't necessarily need an explanation to make the listener appreciate what Bindman is trying to accomplish. It does add a further perspective to what inspired the work, but the music also stands on its own. Although the album might be considered an entry into the world music category, it's better to call it a new forceful strain of jazz. 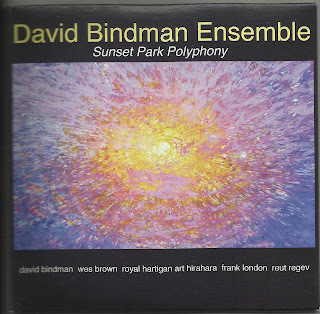 There are moments in "Sunset Park Polyphony" (the piece) that sound like Bindman is coming out of a Coltrane Quartet style, playing over a drone, shaping and reshaping a phrase. Then towards the end of his solo, which is only the opening section, his choice of notes take a more Eastern European dynamic. Of course Coltrane drew on a lot of these influences in his work, so it's less a case of Bindman trying to evoke his forefather and more of him going to the original source. Here, hartigan seems to play with speed, accelerating and slowing down during his solo. In several pieces, the Bindman ensemble creates a pregnant pause between sections, which always adds a bit of suspense to the piece. It happens in at least three tracks and always works well. "Landings Suite," the story of Eyepod, a modern day Icarus, begins with "The Transient" where a 31-pulse cycle has all three horns (Bindman, trombonist Reut Regev, trumpeter Frank London) playing around each other, with all of them moving forward and not losing any focus. The other five sections of the suite continue with wide-ranging textures, which sometimes sound like some of Gil Evans' scoring on Sketches of Spain, other times incorporating a piece Bindman wrote for a dramatization of Billy Budd. The final movement, "Recurring Dream" has a ska/reggae feel which is grouped in pulses based on African drum calls. This isn't simply a good time groove, it's something deeper. Bindman, whose rap sheet includes work with Wadada Leo Smith, Anthony Braxton and the Brooklyn Sax Quartet (which he co-founded), might not be working out of the same concept as Dave Holland, but he achieves something that Holland has done while working in odd time signatures. He doesn't let listeners get bogged down in the rigidness of them. And the band - which is completed by pianist Art Hirahara and bassist Wes Brown - makes it sound as natural as if they were swinging a 4/4 groove. I counted out the 23-note phrase of "Robeson House Echoes," (a piece dedicated to the late Bill Dixon, who would like this album) and the feeling was just as exciting.